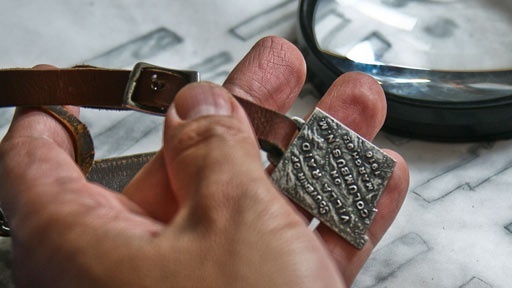 Just before he died a man gave his neighbors a most unusual gift: a watch fob commemorating Francisco “Pancho” Villa’s murderous raid on the border town of Columbus, New Mexico. The man says he was a boy when the raid happened in 1916, and he and his parents survived by hiding under a train car. The new owners want to know more about this watch fob. Who made it? Did their friend indeed witness this infamous raid? History Detectives’ new guest host, Eduardo Pagán, leads us on a history expedition that reveals an especially wild chapter of the American West. Also in Season 7 John Adams Book Was this book a gift from John Adams to his son? Also in Emerging Modern America: 1890-1930 Sears Home Might an Ohio couple's residence be a long-forgotten Sears home? Also in Emerging Modern America: 1890-1930 Tiffany Window What can this watercolor reveal about the unexpected world of one of America’s great artists? Related Investigation Sideshow Babies Was the owner of this cup once a four-pound sideshow exhibit? Also in Emerging Modern America: 1890-1930 Luxury Liner Picture Frame Is this picture frame a piece of the Titanic, Lusitania or neither? Also in Season 7 WWII Diary Does this diary hold the key to understanding the fate of a missing bomber pilot from World War II?